Coconut Cake made with coconut milk, coconut sugar, cake flour, and freshly toasted coconut chips. 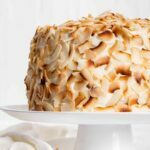 This cake is absolutely hands down the best coconut cake recipe for coconut lovers! Preheat oven to 350 F (176 C) and prepare three 8 inch round cake pans. In a medium bowl, add sifted flour, baking powder and salt. Use a hand whisk to mix and then set aside. Place softened butter in a large bowl. Using hand mixer beat until smooth and fluffy. Add in coconut oil and sugars. Mix until well combined. Pour in egg whites, coconut milk, greek yogurt, and coconut extract. Continue to whip until smooth. Slowly add flour mixture to wet mixture. Work ingredients together to make a smooth creamy batter. Divide batter amongst the cake pans. Bake for 20-22 minutes or until toothpick inserted into the center comes out clean. Place pans on cooling rack for 10 min. Remove from pans by flipping upside down onto a plate. Freeze layers for 30-40 min before assembling. Make sure cream cheese and butter are room temperature, otherwise mixture will curdle or look like cottage cheese. Add cream cheese and butter to the bowl of a stand mixer. Slowly spoon in powdered sugar will mixing on medium low. Use spatula to scrape across the bottom and sides of bowl. Then turn up to medium high and mix thoroughly. Place a dollop of frosting onto cake serving dish. Trip domes off each layer to create a level top. Place first layer down onto dish. Cover top generously with frosting. Flip top layer upside down and place onto frosted second layer. Cover sides and top with frosting. Smooth with a bench scraper or spatula. Cover sides and top with coconut chips. *Store cake in the fridge.